just up the pike: people on The Other Pike are sensible . . .
people on The Other Pike are sensible . . . 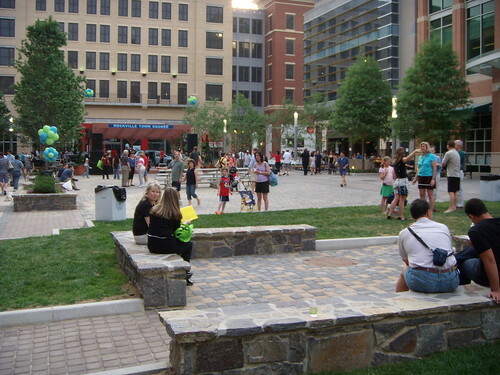 This picture's from four years ago, but we've been assured Rockville still looks this nice. Turns out, there are others in local government not too thrilled with the idea of a teen curfew in the county. The Montgomery County Council and Rockville City Council held a joint meeting October 10 to address issues ranging from the controversial teen curfew to parking for patrons of the Rockville library. Both councils seemed to agree that the curfew was not a solution, with City Council members pointing out that there could be problems if the County adopts it and the City does not. City Councilmember Mark Pierzchala agreed with County Councilmember Andrews that the facts do not warrant the need for a curfew. “I share your views that the data doesn’t support it. I think where Rockville has to be careful is if the county does adopt it and Rockville doesn’t. That could create some confusion,” said Pierzchala. This isn't the first municipality to express their discomfort with County Executive Ike Leggett's proposed youth curfew. In August, Takoma Park's police chief Ron Ricucci said that city, known for its progressive bona fides, isn't particularly comfortable with telling parents when to let their kids out. "We have control of our kids," said Ricucci. I've written no shortage of posts on the curfew since it was first proposed three months ago, and opposition remains strong, not to mention there's a serious body of research proving curfews ineffective and a nice list of more effective crime-fighting alternatives that we got straight from a MoCo police officer. I'm hoping Leggett, despite his Rick Perry-like aversion to facts he doesn't agree with, sees the writing on the wall and gives this up for good. What is the second bit of news? Welcome back to the debate Dan. We all should recognize that this issue has led to a lot more open discussion about gangs, about funding youth development programs about teen centers. Nonetheless, I think the reporter for the Sentinel made the fundamental mistake that Phil Andrews speaks for the Council on this issue. He does not. George Leventhal, who is undecided, has said the votes are there to pass the curfew. As for the city of Rockville, their council does not have to impose a curfew. This blog has turned into an EXHAUSTED tirade against teen curfews, rather than diverse weekly news updates. This has caused me not to even look at the blog. Please post other things besides teen curfews so that more people will visit the blog and enjoy an array of stories and perspectives on a range of topics. You have stated your point NUMEROUS times and at this point, you should rename the blog, "JUST ABOUT TEEN CURFEWS" I miss the Silver Spring Penguin, she updated CONSTANTLY. Silver Spring Singular updates only once in a blue moon but at least they post different topics and don't belabor points. I think Dan's focus on this issue is well placed. As I argue here -- "From sundown towns to a midnight county" -- there's some bad history and real concern with curfews, and a lot of very troubling rhetoric to go with this one. We shouldn't take every bad incident as an excuse to shred each other's civil liberties; that's what we're threatening to do here, and I'm glad Dan cares about it.